It has always been a side note aim of mine to visit all of the world’s Disney and Universal theme parks. Although I won’t anymore go unnecessarily out of my way to visit a park that I don’t think will be very good (after my experience with Tibidabo), if the opportunity is presented to me there’s no way I’ll be missing out. Such an opportunity arose after my first year of university. One of my course colleagues and closest friends at Uni is a Malaysian, and kindly invited three of us to stay with him and experience the country. Singapore is the tiny city state at the very south of Malaysia, and seeing as it’s only a three or four hour drive from his home near Kuala Lumpur, we headed down there early on in our trip. We stayed in the southernmost city of Malaysia, Johor Bahru, a city which exists only because of Singapore: living costs in Malaysia are far less, whilst wages are significantly higher in Singapore, and so many reside in JB and commute to Singapore. We did exactly this; it was a simple 15 minute drive into Singapore (although we were very lucky, the jams on the bridge can turn the 5km journey into an hour or more) before taking the Mass Rail Transit, Singapore’s efficient but painfully slow moving train system. We arrived at the monorail station at about 11.30 and were quickly headed to the island. Universal Studios Singapore is just one of the attractions, albeit the headline, in Resorts World Sentosa. Sentosa Island is to the south of Singapore and is made completely of reclaimed land. Prior to the resort’s opening in 2010, Singapore was home to no Casinos, and as a result both Resorts World, who are Malaysian, and Las Vegas Sands placed competing bids to build on the prime location of Marina Bay, opposite the expensive Central Business District. Sands won, which gave rise to the hugely impressive Marina Bay Sands hotel, but Resorts World managed to secure their own casino resort mainly by virtue of the Universal Studios section of the proposal. The park is the first stop on the monorail and the first thing I noticed was just how quiet it was. Compared to the three American parks it was extremely empty, although that is in part because the schools have now gone back in the country. The atmosphere is good, but it does feel a little forced. Like Islands of Adventure, Universal’s premier park in Orlando, the park was built from the ground up (whereas the two other American parks have been constantly expanded and edited, with rides being replaced, since their openings), but unlike Islands, USS is also very small and so it doesn’t exactly feel like a true theme park. Singapore is a hot, hot country and the park is well equipped for the conditions; large stretches of pathway are under transparent roofing with aircon, it’s as close to being inside as you can get whilst being outside. The two entrance areas, Hollywood and New York, are under cover and air conditioned. And it's neccessary. Transformers was first up, and as the Hollywood version is my favourite dark ride of all time, my expectations were high. The Singaporean version was actually the original, and the ride is very well integrated into the surroundings. Unlike in Hollywood, where the ride is plonked down in a huge, unsubtle soundstage, here the entrance is merged into the sidewalk and so it feels like you are in a real underground building. The queue was the longest of the day at about half an hour, but this was actually a good thing as it allowed me to get full look at the extensive theming, especially the videos that build up the pre-ride story line. I have written a separate, detailed review of the ride, but as you can see from my Top Tens, it remains in the top spot as my favourite dark ride; there is too little to distinguish it from the Hollywood version to rank them separately. The big disappointment of the day was that Battlestar Galactica, the park’s signature roller coaster, a twin tracked Vekoma, was closed and in fact has been since the end of July. From pictures the ride doesn’t look that impressive, however when you are under it it’s huge. I suppressed my disappointment and we quickly moved on, heading into the Ancient Egypt area. The Revenge of the Mummy is one of Universal’s all time most successful attractions. 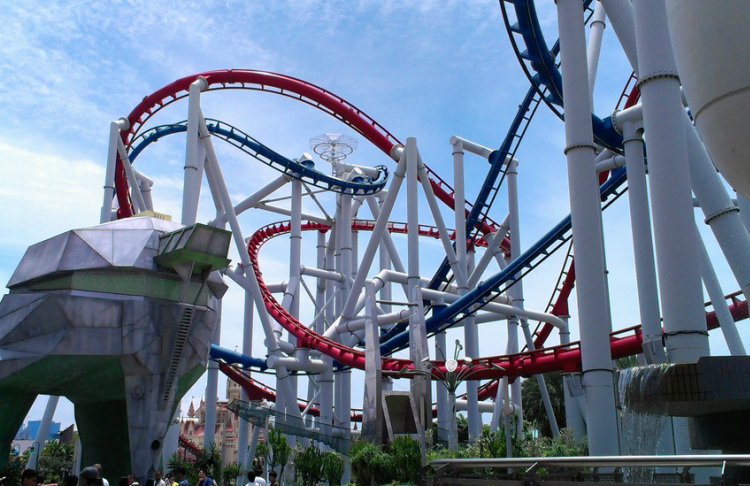 The pair of originals opened in 2004 in Hollywood and Florida, and because of their continued popularity Singapore installed the third in 2010 as one of their major debut rides. This is the first time that The Mummy has a whole themed land to itself, and as a result the external theming is more impressive than either of its sisters; there are huge jackals and sphinxes, and the entire facade of the building resembles a temple. The 2004 opening of the rides was odd in that the chain opened two rides with identical names and themes, but with different layouts, one larger than the other. Making one ride so clearly superior to the other risked the smaller one being negatively received, but because the rides are in total darkness the differences are generally unnoticed. The reason Hollywood’s is smaller is because the park has very little space to work with, and had to cram the ride into a very specifically shaped soundstage. Fortunately Universal Singapore has no such problems and so they have the larger, better model. Unfortunately the positive comparisons end there. Despite the impressive external theming, the internal theming is dire. The ride feels like a big, empty warehouse. There are a few animatronics dotted around but it all feels very blocky and cheap. It’s a real shame, there just needs to be a bit more going on, but it feels like the ride is still in a beta test. The actual roller coaster is good; the launch is fun and the layout exciting, but it’s brought down by the two dimensional feel. After the main roller coaster segment you abruptly stop; and there’s a big difference between the Florida and Singapore versions. In Florida you stop and hear the classic announcement telling you that the ride is over and you can pull up your lap bars, but suddenly the glass of the ride operator booth smashes and it’s revealed to be The Mummy himself. Of course the ride is not over and he laughs at you as the entire ceiling sets on fire before you blast off for the final part of the ride. In Singapore the ride just stops, there’s a lame torso animatronic of The Mummy, and only the edge of the ceiling catches fire. I would therefore rank it as the weakest of the three. It’s by no means bad, but it just feels a little cheap compared to the other two. Jurassic Park is one of the few attractions that is present at every single Universal resort in the world. Hollywood built the original in 1996, before Orlando and Osaka cloned it. Singapore’s version, however, is slightly different. Whilst the other three are large river splash type rides, with huge final drops, Singapore’s is a rapids ride. The ride starts off in familiar fashion; you dive into the mysterious world and interact with a number of large animatronics. The fact that you are in a circular rapids raft rather than the usual forward facing boat is a little annoying, as you often end up missing dinosaurs because you’re facing the other direction. Eventually, after some fun rapid sections, you enter a large building, dubbed the hydroelectric plant, which is very atmospheric. The raft is taken up a vertical elevator, before the final 40ft drop (which is unusual for a rapids ride) out of the building, whilst being snapped at by a T Rex. All in all it’s a fun ride; it’s not a patch on the other versions because of the lack of the huge final drop, and some of the animatronics are considerably scaled down, but it’s still a strong attraction. There is also slow moving suspended coaster called Canopy Flyer, but we skipped it because of its half hour plus queue. We then hungrily walked around the rest of the park, Far Far Away and Madagascar before getting lunch at Loui’s NY Pizza Parlour. Having eaten only Malaysian food for the past few days it was heavenly to get some western food, and these 20 inch pizzas are not to be missed. We shared one between three of us and it was still a tough job. There are plenty of other Italian dishes on the menu too for those not keen on pizza. After lunch we tried out Lights, Camera, Action, a special effects stage hosted by Steven Spielberg. The ride is a kind of merger of Twister and Disaster in Florida, but it doesn't really match up to either. Disaster works incredibly effectively by mixing in brilliant humour, introducing the quirky director Frank Kincaid (played by Christopher Walken) as the host. Whilst Spielberg is good, and obviously very well known across the world, there’s no real atmosphere. The actual special effects replicate a hurricane in a New York boat house; there’s the usual fire, gas canisters and falling ceilings, but there’s even a large cruise liner that enters the building at the very end. It’s fun and quite impressive, but it’s not very long and doesn't do too much. The lack of Battlestar Galactica quickly revealed how reliant the park is on its major attractions; we were soon onto rides that we wouldn't usually have bothered with. Sesame Street Spaghetti Space Chase was a nicely themed and fun dark ride, but I couldn't help but feel it would've been infinitely better if it had a shooting element; that kind of interaction is something the park is sorely missing. We then had the horror of sitting through the Monster Rock show. The show involves Universal’s impressive line up of classic monsters (Frankenstein, Mummy, Dracula, Wolfman, Phantom etc. ), but humiliates them by getting them to perform current, rubbish pop songs. It was very cringey, although I can see how younger children might like it. Madagascar: A Crate Adventure is another Singapore exclusive ride, and externally it’s hugely impressive, being housed in a huge ship. However, like The Mummy, internally it feels lacking. It’s a children’s ride of course, but again it feels like there needs to be a greater level of interaction; at least a slightly exciting fast section or a drop. But it’s almost ten minutes long and it does have its funny moments. Finally we hit up Shrek 4D, the other omnipresent Universal ride, which I always enjoy, and despite our seats not working properly it was a good laugh. The final ride is a Vekoma family coaster called Enchanted Airways, but by this point we didn't have it in us to wait another 20 minutes for a family ride. One of the great things about the park is that the attractions are designed to handle massive capacities; In Japan and America the parks get annual attendances of 8, 9 even 10 million people. Singapore last year got just 2 million, which is not too shabby I hasten to add, but it means they can move the smaller queues through very quickly. Compared to its four sister parks it’s lacking. I imagine Battlestar Galactica is very good, it certainly looks it, and with that running they have two world class attractions (That and Transformers) and two other strong ones (Mummy and Jurassic Park). The other rides are few and a little lacking, but with a few years of improvement, and hopefully some expansion, this park could be right up there with the best in the world.